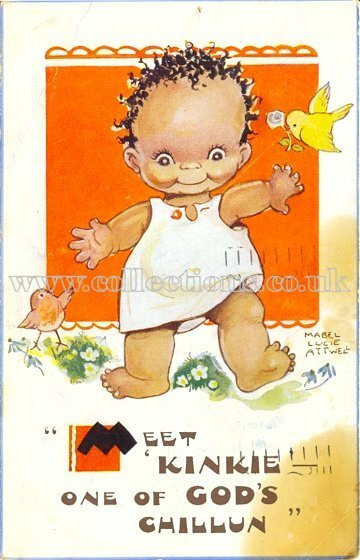 Title: 5498 - "Meet 'Kinkie - one of God's chillun"
Publisher: All Genuine Attwell Postcards Have The Artist's Signature Thus:- (shows example of signature) 5498. "Dearest Barbara, We went to see some electric cookers in the shop after we left you. We are going to have one. Do hope your finger is better. See you this afternoon Darling with love from Mummy & Daddy"